According to a recent report from the University of Maryland’s Do Good Institute, the number of American volunteers has reached its lowest point in two decades1. The decrease in community participation may be felt most in underserved communities and groups who are already dealing with limited resources and funding. 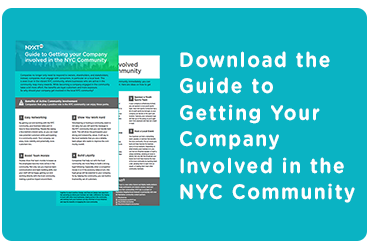 While New York organizations have a large pool of volunteers to choose from, it can be intimidating for new New Yorkers to find and join these organizations. If you are new to the city and are searching for a community organization to get involved with these groups are a perfect way to make a difference in your community and connect with your neighbors. Explore these group volunteer opportunities in NYC with the American Foundation for Suicide Prevention, Autism Speaks, the Breast Cancer Research Foundation, the LGBT Center, and the Womanity Project. The AFSP is a health organization dedicated to saving lives, emphasizing mental health, and bringing hope to individuals affected by suicide. Through scientific research, public education, policy advocacy, and supporting survivors of suicide and those affected by it, the AFSP works to connect people and build a national community to take action against suicide. Volunteer for mental health, learn how you can get trained to help others, and help work towards a world without suicide. See more AFSP videos on the NYXT website. The American Foundation for Suicide Prevention (AFSP) raises awareness and funds research that helps break down the stigma around suicide. Through dozens of suicide prevention kits, the organization has made it easier for people in all environments and age groups to discuss suicide prevention. As the second leading cause of death among 18 to 34-year-olds, suicide has become an epidemic in America. To join the fight against suicide, assemble a group of volunteers to walk, volunteer, or discuss suicide prevention at school. Autism Speaks helps individuals with autism and their families through advocacy, support, understanding, acceptance, and advancing research to enhance the lives of people on the autism spectrum. Autism occurs about 4 times more frequently in boys than in girls. Autism Speaks collaborates and funds research treatments to help identify the causes of autism, increase the availability of treatments to increase quality of life, and provide effective interventions for individuals and families with autism. Help enhance the lives of people with autism, and learn how you can advocate for their rights and services. See more Autism Speaks videos on the NYXT website. Autism Speaks helps communities understand and accept people with autism. Their efforts have resulted in a $3 billion increase in federal funding for autism spectrum disorder (ASD) and over $9 million in community autism-related grants and scholarships. However, there is still work to be done to change the narrative on autism as 1 in 59 children are diagnosed with ASD, two-thirds of which will be bullied between the ages of 6 and 152. BCRF is committed to preventing and finding a cure for breast cancer. BCRF provides funding worldwide for cancer research and over 90% of their donations pay for research and awareness programs. Help end a deadly disease that impacts millions of women and men each year. See more BCRF videos on the NYXT website. The Breast Cancer Research Foundation (BCRF) was founded in 1993 to help fund the projects of top medical professionals. While the group proudly supports nearly 300 scientists worldwide, the fight to end breast cancer is far from over. The disease is still the second most common cancer in men and women worldwide3. To help raise awareness about breast cancer and support teams of researchers across the globe, organize a bake sale, a community bike ride, or run in a Tough Mudder with your friends. The LGBT Center first opened its doors at the onset of the AIDS epidemic in the 1980s and has been a safe haven for the community ever since. Today, The Center provides a range of mental and physical health resources so that members of the LGBT community can lead happy and healthy lives. Join a community group, attend an upcoming dinner, or attend one of their upcoming events (included below) with your friends and help the organization achieve equality for all. In America, women face an uphill battle towards equality as one-in-three women will face sexual violence in their lifetime4 and four-in-ten will face gender discrimination at work5. The Womanity Project, a nonprofit organization based in Brooklyn, is fighting for respect and equality for all. On their platform, everyone can celebrate their experiences around gender, race, and equality. The nonprofit also works with groups and organizations of all sizes who would like to challenge the current gender narrative and become better listeners, readers, and collaborators. Support for programs such as these is more crucial now than ever as volunteer rates have fallen to their lowest levels in twenty years. By getting involved with the AFSP, BCRF, LGBT Center, and Womanity Project you can find a sense of community and help your fellow New Yorkers lead better, healthier, and safer lives. If you are interested in more ways to get involved in your community, subscribe to NYXT for monthly updates on community engagement opportunities in New York City.